Protect yourself while riding, and look great at the same time wearing this black leather motorcycle jacket. This jacket features thermal lining for colder weather, zippered pockets for safe storage and a half belt for the perfect fit. I researched this jacket for awhile as far as prices and sizes go, I kept looking at it on Amazon and I really wanted it, but didn't want to spend the money until I did more research and found my size for about 35 dollars less on overstock! This jacket seems to run true to size with a convenient zip out liner. I would recommend sizing up if you're looking more for comfort than fit. The details on this jacket are really nice andit's not as heavy as I thought it would be! The jacket got here quickly too. This is my first purchase from overstock.com and im glad I bought it. I had been wanting a "moto" jacket for quite some time, but hadn't seen any that I liked enough to purchase. I didn't want the girlie, trendy, fashion statement style that is so prevalent now. This one is nearly perfect. It's a heavyweight leather, weighing about 5 pounds. I know it's not a throw-away coat; it's a garment that I'll wear for many years to come, due to its classic styling and durable construction. Choosing a size was tricky for me, because the Overstock size chart is fairly generic, and I wanted a chart that was specific to this product. If you do an internet search for this brand (Milwaukee Leather) and jacket style number, you'll land on the big seller that's named after a rainforest and you'll be able to see -- what is to me -- a more accurate size chart. Based on that chart and my measurements, I chose a size Large, though my instinct was to go for Medium. I probably could have gone for the smaller size, but due to the corset lacing on the sides, I'm able to draw the jacket in all the way at the waist and still have the room I need in the bust. I am happy with the fit of the Large; it gives enough room for layering and for ease of movement. Just an FYI, the side lacing means that you'll have 1 to 2 inches of adjustment on each side, so you'll be able to customize the waist. The cords are long, and I didn't want to cut them, so I doubled them up and re-laced the jacket. It works for me. I nearly studied this jacket with a magnifying glass upon its arrival. The stitching is excellent. Outside zippers are heavy-duty and move easily. Snaps and grommets expertly attached. Overall, the leather has a nice hand, soft but not fragile. But there are a couple of concerns: First off, I believe that this jacket may be a factory second, though not stated as such on the Overstock listing or on any of the documentation that came with the coat. My jacket has an approximately 2mm hole on one of the side panels, near where the belt attaches. It's barely noticeable and I don't think that it will affect the wear of the jacket. It looks like an errant awl strike. Perhaps the Q/C department missed this. My second concern is the zip-out liner which has a nylon zipper that I don't think will hold up to repeated zipping and unzipping. Also this zipper doesn't match up correctly, so I'll need to take extra care if/when I do remove the liner. When the zip-out liner is removed, the jacket is still lined. It's a fully finished garment. Overall, it's quite nice and I consider it a bargain. 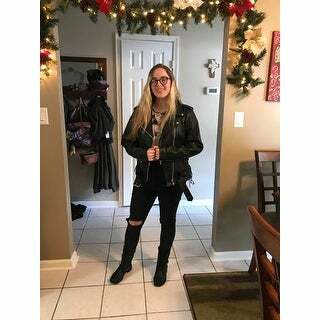 Very happy with this purchase and I would recommend it to others who are looking for this style of leather jacket. This jacket is awesome! Perfect fit, great quality of leather, looks great! Love the zip out liner. Highly recommend anyone who likes to ride motorcycles to purchase this jacket. Love this jacket. The fit was perfect and the quality made very well. Also warm when riding on a motorcycle. I enjoyed wearing this jacket as casual and dressy. A REAL MOTORCYCLE JACKET, HEAVY FOR A REASON. I BOUGHT THIS JACKET BECAUSE OF THE REVIEWS IT ALREADY HAD. 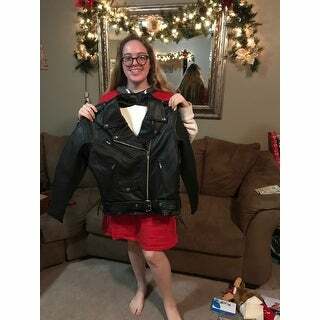 MOST SAID THE JACKET WAS HEAVY AND THAT IS WHAT I WAS LOOKING FOR, A GOOD LEATHER JACKET FOR RIDING A MOTORCYCLE AND THIS FITS THE BILL. I WOULDN'T SAY IT IS SO HEAVY THAT IT IS UNCOMFORTABLE ON A BIKE, WE ARE USED TO GEAR AND THIS IS A GOOD PIECE FOR RIDING. THIS STYLE HAS BECOME VERY FASHIONABLE, AND I BELIEVE MOST PEOPLE ARE LOOKING FOR THE LOOK NOT A GOOD QUALITY REAL MOTO JACKET. THIS IS A REAL MOTO JACKET. I USUALLY WEAR A 2X, BUT BOUGHT A 3X BECAUSE THAT WAS ALL THAT WAS AVAILABLE. IT FITS LARGE, BUT I DON'T MIND THE EXTRA ROOM, IT IS EASY TO PUT A HOODIE UNDERNEATH FOR BRISK RIDING NIGHTS. I SAY THIS JACKET RUNS TRUE TO SIZE. IF YOUR'E LOOKING FOR A FASHION STATEMENT THE JACKET WILL BE CONSIDERED HEAVY, BUT FOR A RIDER IT IS A GREAT PIECE AND I'M GLAD I PURCHASED. Absolutely perfect! It is completely a riding jacket, meaning the grain of the leather is thick, it fits great!!! I wear a xl sometimes 2x because of the girls and this size fit great for me, even a little extra room when I take the liner out. It has broken in very well, and the lace up on the sides helps me keep it tight when going down the road. Great product! 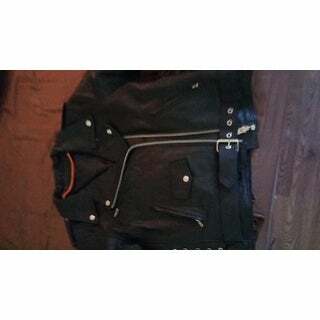 Great quality leather coat with zip in/out liner. True to size. Should be warm in winter. This is a real motorcycle jacket. An extra small fits a size 2. It is slightly big on a size 0. It is really well made and looks very durable. The only downside is that it is quite heavy. I got it quickly. Great price. The shipping was free. The material is thick quality leather. The style is current, trendy, and classic. This jacket will last forever. It is a bit heavy and a little stiff but will age well. It comes with a zipout liner which does make it a little bulky. The jacket is a little boy in shape so I sized it according to the size I wear which it is snug, (with the liner) without the liner fits a lot better. Over time I think it will loosen and stretch. Lots of pockets. I love everything about it. Great buy. Omg!!!!! I love the look the fit!!!! It didn't take as long as I thought to get it!! Wish it came in purple (hint hint) lol, but if u want a good looking jacket that fits great!!! This is the one!!! Love the jacket! Good quality and fast shipping! My daughter absolutely loved it!!! The jacket is gorgeous, truly is what it says it is. Also comes with a zip in or out liner for added warmth. LOVE this jacket. This one is good looking, but not just for looks. Sturdy, heavy duty, plenty of pockets inside and out. Zip in liner .. or wear without. This is a beautiful jacket and exactly what I was looking for. It's heavy but extremely warm Great for wearing in the winter. Receive compliments every time I wear it! "I weigh 150 lbs & my bust size is 40c I am 5' tall would an ex be too big for me?" It depends on the fit you like the jacket is heavy and is a good jacket for riding I like it a little on the large side so I can put a sweater underneath. It seems to run true to size so if an extra large is usually too large for you then it will be too big. "Is the actual weight of the jacket heavy? Or is it heavy as in warm? I'd like to get it for travel, but i don't want to wear a very heavy (as in actual weight) jacket while walking all day, every day." This jacket is heavy - weighty heavy. It is very nice jacket, but I've been unable to wear it because of the weight. Hope this helps. Going for a ride. Need this jacket. "Ok, my turn. I am 5'8 and I wiegh about 205 and bust size is 38D...XL ok for me?" "Not sure if I should purchase the M or L, can you offer any advise? I am 5'6 and weight 130. 36C bra size. Any feedback on sizing would be greatly appreciated. Thank you! :)"
A few standard guide lines. What is the fabric, will you wear it open or closed? shoulder fit? what is the bust size. You want to wear the jacket and not have it wear you. Medium - Best for a Tight Fit… Large for a Loose Fit whichever you prefer more. "I don't get the sizes on this there are like options twice for large etc w different prices....is it heavy enough w the liner for a Colorado winter and what are the measurements for a medium?" I would follow the size chart, i got the LG and it fits true to size, the jacket is comfy and warm with the liner but I'm not sure how bad Colorado winters are if you want to fit a sweater, sweatshirt etc; underneath you may want to size up. Sorry I can't be more helpful! This item is made with Premium Milled Cowhide leather.